Sound insulation tests are required at the pre-completion stage of building works in order to comply with Part E of the Building Regulations. Air Tightness Solutions are a UKAS accredited company for sound insulation testing and offer the highest level of service and expertise for achieving Part E compliance, working closely with our clients to give the best possible chance of achieving a pass certificate first time round. We provide a nationwide sound insulation service, which is delivered within 72 hours of your order. Sound insulation testing, or pre-completion testing must be carried out on new build properties as well as converted properties. A property will either require an Airborne test or an Airborne and Impact test. Airborne tests are carried out on all separating walls between habitable rooms of flats and houses. Airborne and Impact tests are carried out on the separating floors between habitable rooms of flats. When choosing a sound insulation testing company, you should ensure that your supplier has UKAS accreditation. What are the Building Regulations for Sound Insulation? 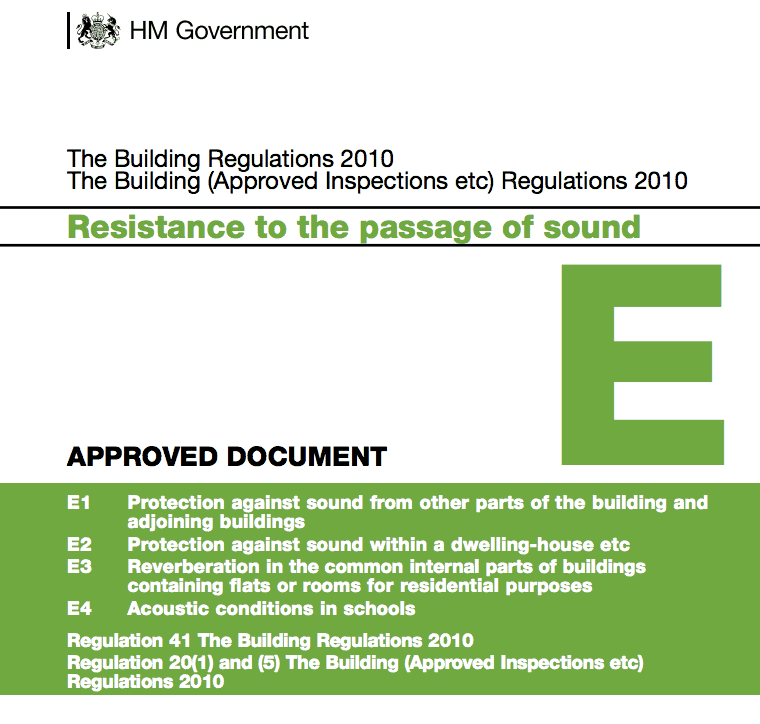 In England and Wales, sound insulation regulations are contained in the Building Regulations Approved Document E (ADE 2003, as amended). This is generally referred to as ‘Part E’. The regulations require that buildings achieve minimum performance standards for sound – across both airborne and impact sounds. These performance standards differ across new build and conversions. New build properties need to meet the requirements of DnTw+Ctr ≥45dB and LnTw ≤62dB. Conversion properties need to meet the requirements of DnTw+Ctr ≥43dB and LnTw ≤64dB. Different values apply to rooms used for residential purposes, for example hotels, student halls of residence, and hostels, however these are still covered under Part E.
When is a sound insulation test required? Detached properties and some refurbishment projects do not need sound insulation testing. We’re happy to advise if you’re not sure whether or not you require a test. Call us for free advice or send an e-mail to discuss your requirements. We are more than happy to advise on how to construct your project so that your test is most likely to pass. We have inspected and tested thousands of properties, so we know what to look out for, what recommendations to offer, and how to ensure your construction methods align with building requirements to meet both your needs. What happens if my sound insulation test fails? As long as the work is carried out exactly as we specify in our on-site consultation it is unlikely that your test will fail. However, in the eventuality of a failure we provide a free consultation to ensure that a cost effective solution is concluded. If you want to find out more about sound insulation testing, or simply need some expert advice, we’d be delighted to help. How do I prepare for a sound insulation test? Are there sound insulation requirements for commercial units? If a commercial unit, or room of non-residential use, adjoins a residential dwelling, sound insulation standards may apply, for example, when a residential flat is positioned above a shop or bar. In such cases, the sound insulation performance standards may be enhanced, and additional airborne sound tests may be required in order to achieve Part E compliance. For specific details about your sound insulation and testing requirements, please get in touch and we’ll be happy to help identify what you need to do, and what tests will be necessary. What is the difference between airborne and impact sound testing? Airborne sound tests measure the amount of sound transmitted through the air – in a residential environment, this might be speech, TV or radio, pets barking, or singing. Airborne sound insulation tests identify how much of this type of sound gets through the wall or floor. Noise tests use high noise levels to determine how ‘soundproof’ the room is, and how much the walls and floor block the noise from travelling to adjacent rooms or properties. Impact sound tests measure the level of structure-borne sounds that occur – in a residential environment this generally refers to footsteps. Impact sound insulation tests determine how much of this sound is blocked by the separating floor. This type of test uses an impact source that is calibrated to deliver a measured level of impact in the room being tested. If you’re nearing the pre-completion stage of your building project, get in touch and make sure all of your compliance requirements are fulfilled on time. Why Choose Air Tightness Solutions? Air Tightness Solutions are industry experts, offering you robust, fair, and high value services to ensure you meet your regulatory requirements.